Sometimes things fall by the wayside. Lawns don't get mowed, small repairs get forgotten. This isn't so much of a big deal, but when you're talking about living foods, well...things get interesting. I made a 3 lb wheel of Sbrinz which I planned to age for six months. That was back in May of 2011. I meant to crack the wheel open a while ago, but kept forgetting about it. Sbrinz, my favorite cheese, is a hard, raw milk cheese from Switzerland. Unlike the more famous Italian styles (Parmigiano Reggiano and Grana Padano), which are made from skimmed milk, Sbrinz is made from whole milk. This gives it a huge advantage in flavor, but the extra butterfat to age gracefully for up to twenty years. I've had Grana Padano aged for five years and it just tasted old and hollow, like a wine that had crested about a year or two earlier. But now that Carla and I are moving, I decided to finally cut into the wheel. Cutting into it, I was shocked to see it was riddled with bird-eye sized holes. I thought I might had made a bad batch, by letting too much wet acid develop in the cheese by not draining off the curds fast enough. This was a fault pointed out to me on an earlier batch of cheese by Eldore Hanni, a raw milk cheesemaker in Pennsylvania, who has been an licensed cheesemaker since he was 17. The son of Swiss immigrants, Eldore was a wealth of information, even at 85 years old. He has since passed on, but I'm incredibly grateful for his help and guidance. So thinking this cheese was ruined, I still took a small nibble. It was good. Sweet, like a Swiss Emmental, with a firm but sliceable texture. 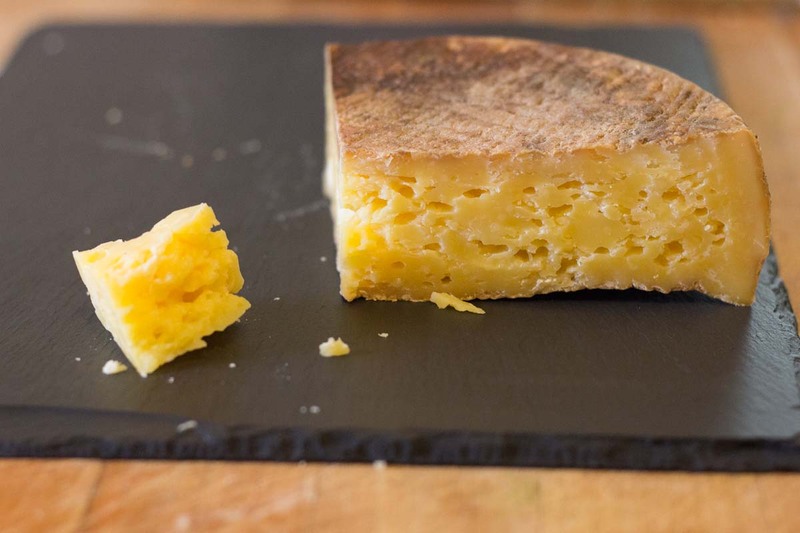 On the tongue it softened, and offered a slightly grainy texture, like an aged Gouda A slight acidic sharpness appeared on the finish, with a bit of grassiness still coming through from the raw milk. Was it Sbrinz, no. But it was good. Odd, but good. The fact that it wasn't rock-hard is amazing to me, but I think that's a testament to the high humidity of the aging fridge. But why the holes? My guess is that somehow Proprionibacteria shermanii, the culture that produces holes in swiss cheese, got into the milk. This could have been present in the raw milk when I got it, or during the culturing of the curd. I've read about coliform bacteria producing gas in curds, but my Sbrinz had that telltale sweetness you'd find in Emmental-style swiss cheeses. So while not the cheese I intended to create, I'm still happy with the results. Hopefully this summer I can make another wheel and get closer to my mark. Thanks so much! You have a beautiful blog, too! Every now and again we get some good Gorwydd’s Caerphilly here, usually around Christmas. But now I'll have to be on the look out for Perl Wen!